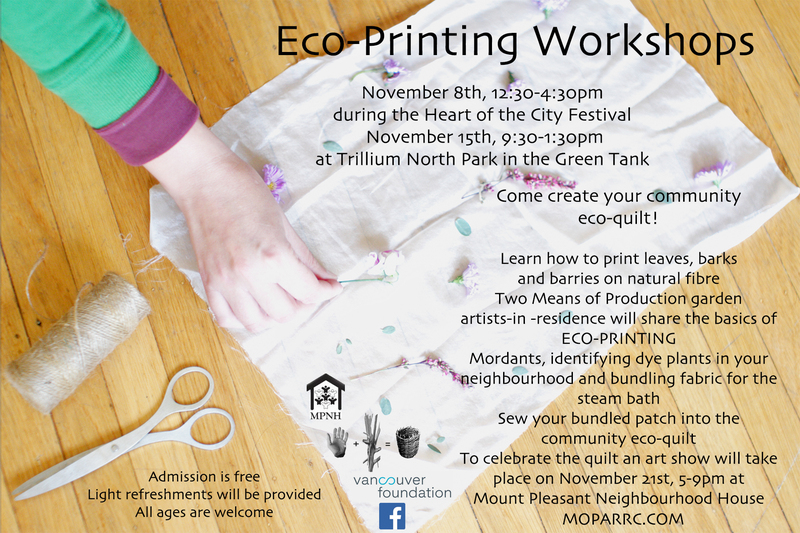 Join the last eco-printing workshop this Sunday! Come help sew our community quilt this Sunday between 9:30am-1:30pm at Trillium North Park! Admission is free, all ages are welcome- there will be a children’s craft!, tea from the MOP garden and light snacks will be provided. This Sunday’s workshop will include the most thrilling part of the process! We will unbundle our eco-prints. The colours are always a surprise! Next we will design our quilt and hand-sew our panels together with elderberry dyed wool. Together we will also harvest a small bundle of plants for those who want to try eco-printing. Each participant can take one panel home!